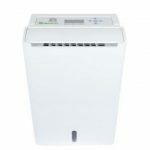 Ecoair DD128 Dehumidifier Review - King of The Desiccant Dehumidifiers? 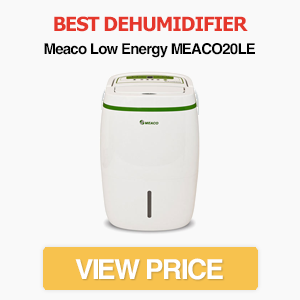 EcoAir describes the DD128 as its “flagship” desiccant dehumidifier. 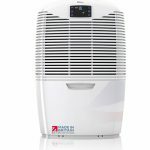 The company even claims it’s “set to become the premium choice for homes, caravans, coats, garages and storage.” As we’ve reviewed a wide range of dehumidifiers, we were interested to see whether it can live up to the hype. It’s certainly a stylish machine, with a curvy design and a range of interesting features. How does the EcoAir DD128 compare to others on our list of the best dehumidifiers though? And how efficiently does it extract water from the air? Keep reading our EcoAir DD128 review to find out. The EcoAir DD128 is a top-quality desiccant dehumidifier. It's stylish, purifies the air and has an energy efficient "Auto" mode for maintaining a 50-60% relative humidity. Most importantly, it's quick to extra water from the air and has a wide operating range (1-40 degress Celsius). We highly recommend it - even if it's not the giant leap forward that EcoAir claims. 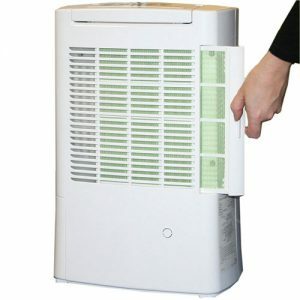 The EcoAir DD128 is a relatively slim-line dehumidifier. It’s available in several different colours, including grey, green, red and blue, although most of the exterior is white on all versions. We like how the subtle curves of the DD128 give it a less “blocky” appearance than many dehumidifiers. EcoAir claims the DD128 is a compact dehumidifier – and with dimensions of 32 x 47.6 x 21.2 cm it’s hard to argue. Desiccant dehumidifiers tend to be smaller and more lightweight than refrigerant, but we’ve still seen models that are much bulkier than the DD128. For comparison, it’s not as slim as the EcoAir DD1 Simple or DD122F1 MK5, but it’s considerably smaller than dehumidifiers such as the Meaco DD8L Zambezi. Like most desiccant dehumidifiers, the DD128 doesn’t have a digital control panel or display. Instead, the various options are selected using buttons located on the top panel of the dehumidifier. The control panel is simple to use, but there’s no digital display of the current humidity. Many people purchase a separate hygrometer for this reason (The TFA Moxx is a relatively inexpensive and reliable option). 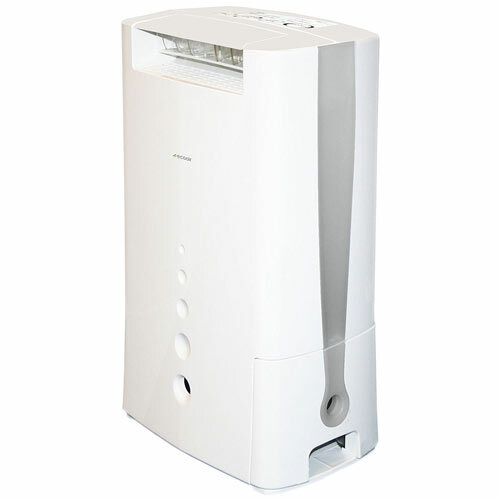 Air that’s pulled into the dehumidifier can also be passed through both an ioniser and anti-bacterial filter. This is great if you suffer from allergies or asthma. Even if you don’t have an allergy, the air in your home feels fresher. The DD128 has several other useful features. EcoAir has included a tilt-protection function that automatically switches off the machine if it falls over. While this probably isn’t needed in a home, it’s great for extra peace of mind if you’re using the dehumidifier in a boat or caravan. The DD128 also has an automatic restart function. The water tank is removed from the side of the machine. 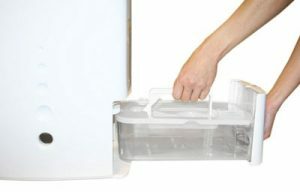 It’s simple to empty and has an anti-drip feature – although we prefer front-loading dehumidifiers. The DD128 has a 2.2 litre water tank capacity. This isn’t tiny, but it’s not large either. For comparison, the biggest refrigerant dehumidifiers have capacities of four litres or more. Be prepared to empty the dehumidifier regularly – especially in damp homes. There’s the option of continuous drainage via a hose though. The tank also comes with a handy anti-drip feature to stop water getting on your floor when emptying. A minor downside is the water tank is removed from the side of the machine. We prefer front-loading tanks, as they can be removed regardless of the position of the dehumidifier in relation to the wall. It can also be difficult to see how full the tank is without removing it, which is a shame but not a major problem. One of the great things about the DD128 is that it’s easy to move between rooms. It weighs just 6.1kg, which makes it one of the lightest dehumidifiers on the market. It also comes with a proper pull-out handle rather than just a carrying indent. A downside is that it doesn’t have wheels. The lightweight design means these are less important than on heavier dehumidifiers though. The DD128 is excellent at extracting water from the air quickly and with minimal noise. If you need a dehumidifier that can work in a range of conditions while maintaining a humidity that discourages mould, condensation and bacteria, it’s a great choice. It has a maximum extraction rate of 8 litres per day on its highest setting, which is achieved at a temperature of 20 degrees Celsius and relative humidity of 60%. This might sound like a low extraction rate compared to the best refrigerant models, but desiccant dehumidifiers are better at extracting water in cooler environments. The DD128 also has a wider operating range of 1-40 degrees Celsius compared to refrigerant dehumidifiers. One of the advantages of desiccant dehumidifiers is they provide an overall heating effect in a room. Even when the laundry mode isn’t active, the DD128 noticeably heats small rooms. Make sure the dehumidifier is at least 20cm away from a wall and has at least 50cm space in-front. This allows for proper air circulation. With its fast extraction rate and 8 litre/day maximum, the DD128 is suitable for homes with up to five bedrooms. It’s also great for boats and caravans. On its highest power mode, the EcoAir DD128 has a noise output of 47dB. This isn’t the loudest desiccant we’ve seen, but it’s not particularly quiet either. The good news is that the noise when in “Low” mode drops to just 35dB. This is considerably quieter than most dehumidifiers, making the DD128 a good choice for living rooms or hallways. It’s probably still too loud for a bedroom, unless you like some background noise, but this can be said for all dehumidifiers. The DD128 is built with EcoAir’s E7 technology. This is a fancy way of saying it monitors the relative humidity and temperature, while adjusting the power to improve energy efficiency. In practice, this means the DD128 has a built-in humidity sensor and can switch between standby, low and high power modes depending on what’s needed. This is important for reducing energy wastage. The dehumidifier will also switch off if the air becomes too dry. You can activate the E7 mode by selecting the “Auto” setting on the control panel. The dehumidifier will then aim to maintain a consistent relative humidity of 50-60%. You can’t set a target humidity though. If you want to reduce humidity as quickly as possible, the “High” mode aims to bring humidity down to 40-45%. The “Economy” mode uses less energy and is quieter, but only aims for around 50-60% relative humidity. This mode is useful for maintaining the humidity of a room once it’s reached your desired level. Note: After you turn off the dehumidifier, the fan continues to run for up to two minutes. This is to cool the components of the dehumidifier and is nothing to worry about. You shouldn’t disconnect the power from the machine during this two minute period though. Drying Mode. 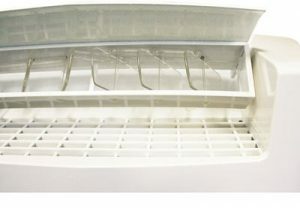 We mentioned these before, but the DD128 has Economy, Auto and High modes for drying. Economy is the one you’ll probably use the most in a home environment, as it aims for a reasonable 50-60% RH while minimising energy usage. High mode is great for quickly removing large amounts of moisture, but it uses more energy and is louder. Auto mode aims to maintain a consistent relative humidity without needing any input from you, by switching between standby, economy and high depending on the humidity. This is useful for boats, caravans or garages, as you don’t need to continuously adjust the settings, but it’s also great for homes. Laundry Modes. Most dehumidifiers come with a laundry mode, and the DD128 is no exception. There are two modes – “Normal” and “Turbo.” Both modes consume more energy than the “Low” drying mode though, as the dehumidifier needs to work harder to dry your washed clothes. Using the laundry mode can reduce drying time to as little as four hours. Timers. Another common feature on most dehumidifiers is a timer mode. The DD128 has a maximum timer of 8 hours, although there are also options for 2 or 4 hours. This mode is great for saving money, as the unit automatically switches off after the set time. Most people will use this mode when they are at work or overnight. A useful feature of the DD128 is the 3D louvre. This allows you to direct air towards problem areas, such as patches of mould. You can also direct it at your laundry for quicker drying. The louvre has an automatic swing function with various options. In “Up” mode, the louvre swings in an upward range which is useful for large rooms. In “Front” mode, the air is directed in a 50 degree range towards the front of the machine, so this mode is great for drying specific areas of damp. There’s also a wide mode which swings the louvre through 150 degrees and a “hold” option. We mentioned the ioniser earlier, but it’s worth revisiting because it’s an important feature of this dehumidifier. The ioniser acts to negatively charge particles that may be carrying allergenic materials. Once negatively charged, these particles drop to the ground where they are easy to vacuum. This, combined with the silver filter, makes the DD128 a great choice for people with allergies. A downside to the silver filter is that it needs to be cleaned regularly. EcoAir recommends cleaning it every two weeks with a gentle brush to ensure it can work correctly. The DD128’s control panel doesn’t have a digital display, but it’s simple to use due to its touch electronic buttons. Most of the options are self-explanatory, although the manual provides a detailed guide to the various functions. There are six primary buttons on the control panel. The largest is the On/Off button, making it easy to switch off the dehumidifier when it’s not needed. Then there are smaller buttons for drying mode (Auto, Economy or High), laundry mode (Normal or Turbo), louvre setting (Front, Wide, Up or Hold), timer (2, 4 or 8 hours) and ioniser (On/Off). Selecting each mode is easy, as you just use the relevant button to cycle through the various options. The EcoAir DD128 is priced just above average when it comes to a desiccant dehumidifier. With an RRP of close to £200, it’s certainly not cheap – but we think it provides great value for money. There aren’t many dehumidifiers that can match it for extraction rate, especially with such a wide operating range. The combination of automatic adjustments to save energy and purifying filter also mean it’s an excellent all-rounder. A bonus is the EcoAir DD128 comes with a two-year warranty. This provides extra peace of mind, and shows EcoAir has confidence in the machine’s reliability. If you need a dehumidifier that can extract water in conditions ranging from close to freezing to a warm summer’s day, the EcoAir DD128 is one of the best options. 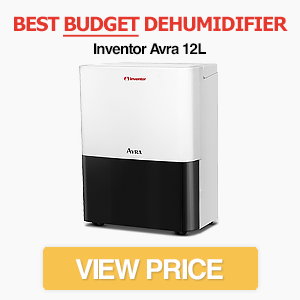 It’s a high-quality dehumidifier with some excellent features, such as the anti-bacterial filter, ioniser and E7 humidity management technology. There aren’t many drawbacks to this dehumidifier, but a front-loading water tank would be more convenient. We’re also not sure the DD128 is as innovative as EcoAir claims. 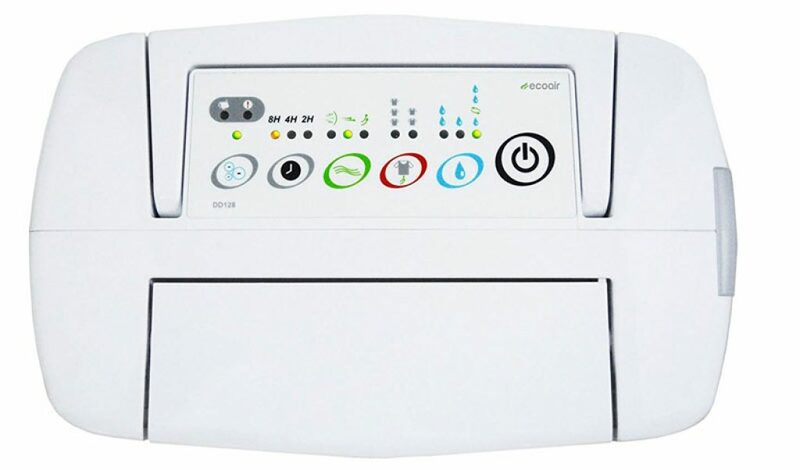 The EcoAir DD122FW MK5, for example, has an even more compact design, anti-bacterial filter and also includes the E7 energy saving technology, while being available for a marginally lower price. It’s true that the DD128 has a higher extraction rate and is probably the slightly better choice, but it’s not a giant leap forward. Even so, this is an outstanding dehumidifier that’s suitable for a wide range of situations. Whether you need to remove moisture from a flat, boat, caravan or house, the EcoAir DD128 is an option to consider.